Below this video of Prezec and Sunshine are notes about submission and dominance, and below them are other videos with interesting behaviors between rats. This gallery was inspired by this first video. The behavior of Prezec is remarkable. Take a look and see. Is Prezec appeasing Sunshine? "I'll be your friend, really! I'll be nice to you!" His behavior looks very much like a typical "bottom rat" in a two-rat wrestle over ownership of something, which we typically understand to be dominance and submission. What I really like about this video of Prezec is that his upside-down behavior is under his control. He's choosing to appease, he isn't being forced into this position. The idea that both top and bottom rat are voluntarily in their respective roles, aligns more closely with the idea of dominance and submission as dance partners. One side leads and the other allows him or herself to be led. Prezec, the bottom rat, is an intact male, and Sunshine, the top rat, is neutered, but he had been neutered a week earlier from this filming, so his testosterone level was still high. Prezec was seen doing the same "dance" with another rat, Stewie, a neutered male who had been neutered about a month previously, and whose testosterone had clearly dropped. Prezec had only recently been introduced to the "Sunshine group". In this video, there was no food involved. We miss the first 30 seconds of the event (at which point Snarf rushed to get the camera). Prezec approached Sunshine, who was sitting on top of the tissue box, and started squeaking and rolled over. Sunshine did not touch him and looked a bit baffled on what was going on. 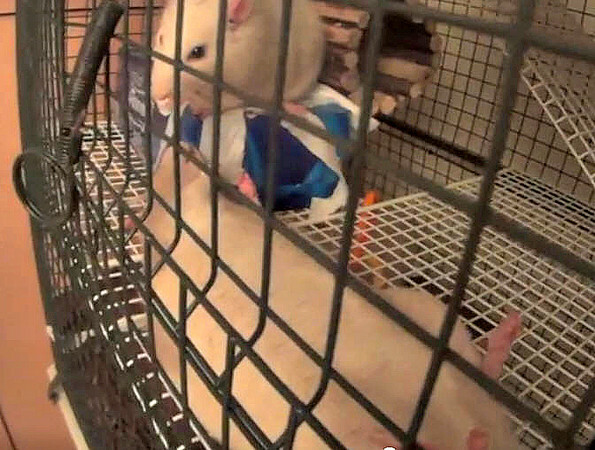 These two wonderful pet rats live in Snarf's Rat Sanctuary which can also be found on Facebook. Many thanks to Snarf for permission to host this video. Prezec's and Sunshine's interactions were the inspiration for this gallery subject. Submission and Dominance may not be what you thought they were. I'm learning about submission and dominance in animals. 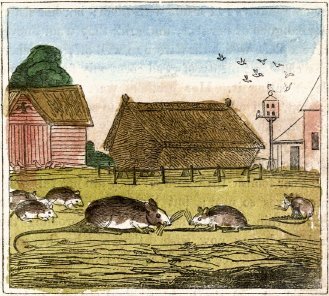 It's not what we in the pet rat world have historically assumed: one rat dominates the others more. One rat is the "boss rat". This page has notes and videos that might help us better understand some of our rats' behaviors. And some thoughts on dominance and submission, some of which come from Patricia McConnell's article, "The Concept Formerly Described as 'Dominance'" and others on her site. 1. Dominance means “priority access to a preferred, limited resource". “Dominance” is about who wins a competitive interaction over something that both individuals want..." Which rat will get the scrambled egg, the coziest spot in the hammock, the mate. 2. Appeasement, or submission, is the other side of the social relationship. The rat that gives up the scrambled egg, chooses that role, chooses to relinquish the egg. One rat takes, the other lets go. 3. All rats can take both dominant and appeasement roles in the dance, depending on the resource involved, the context, and the personalities of the rats. 4. As rats form a social hierarchy, the encounters they have over resources are settled more or less peaceably, as a result of this dance. Rats' behavioral displays "act to avoid conflict rather than create it". 1. Dominance has nothing to do with decision-making about the actions of the group or even one individual rat. Dominance is not one rat controlling another. 2. Dominance is not fixed and immutable. Which rat is dominant varies in time, space, context. Dominance is fluid and complicated. One rat's behavior in one context does not necessarily predict her behavior in another. 3. Dominance is often incorrectly paired with "total control" and equated with use of force. But one rat is not controlling another rat's behavior with "dominant" actions. Thus a pet rat owner should not "use dominance" to correct a rat's behavior. 4. Examples from Patricia McConnell of how dominance can be inappropriately applied to dogs. See if you can come up with similar behaviors in rats: "A dog sitting with his back to you," "Dog running to the front of you on walks." "Jumping up on people." "Refusing to be potty trained." "Using signs of fear to manipulate the owner." None of these are based on dominance. More videos below with subtle, complex, and very interesting behavioral interactions between rats. My goal in hosting these videos is to inspire us to think about how rats maintain their friendly relationship. The role of appeasement (pacifying) to avoid aggressive interactions. Rats do more behaviors that are about staying friendly, than they do being aggressive with each other. After all the goal is to sustain the mischief and the species as a whole. "Cuddle Fight" is the title of this video. Very interesting behavior: I see the bottom rat choosing to lay there, not moving, not really objecting to being "held in place" by the top rat. They aren't exactly playing, either. They both look content. To my eye the bottom rat is allowing himself to be held there. Here we have a poofy rat that is sidling and being very poofy towards the other rat. What does the other rat do? Ignore him. That's one good way to maintain peace. These two rats do not have a history of fighting, and they aren't being newly introduced. If they were being introduced, I would say this poofing behavior (piloerection) should not be allowed to take place as it would signal an impending and probably bloody fight. This is part 1 of 2. These two rats appear to be a bit iffy with each other, which gets exacerbated by "who will get to own the space under the bars". Left side rat gets poofy and starts pushing at the other rat as if to start something up. Then, under the grill of the cage door, he appears to soften and become interested in appeasing the other rat. But the other rat remains tense and slightly on guard, being as he moves around. This is part 2 of the video above but involves a 3rd rat who moves into the scene. Again both rats are cautious around each other. Submission, dominance, and appeasement in pet rats (any species)? They aren't what you thought. Prezec and Sunshine, a snapshot from the video. Is Prezec, bottom rat, volunteering submissive behavior?